Malaysia, located in southeastern Asia, is a tropical country with an abundance of natural resources. With a rich and diverse plant population, Malaysia is one of the world's primary exporters of both palm oil and natural rubber. There are many different types of flowers commonly found in Malaysia. 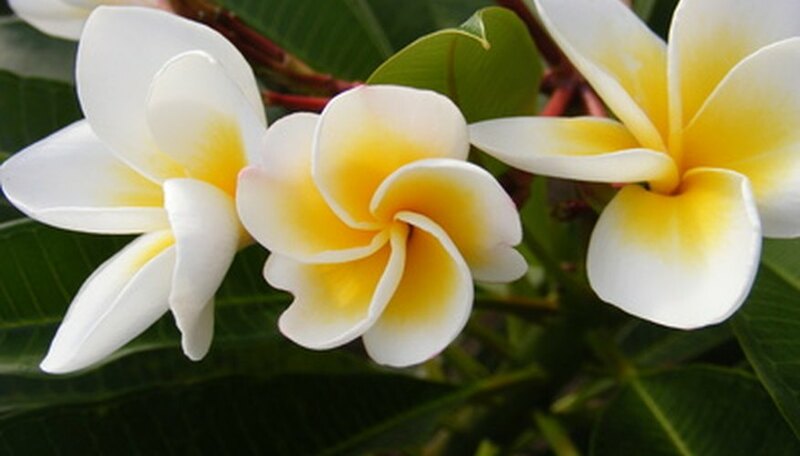 The frangipani (also known as plumeria) is a flower that is common in Malaysia. It is known to natives as "bunga kubur." The frangipani is frequently planted in graveyards in Malaysia, which is why the locals often refer to it simply as the "Graveyard flower." The trees can grow to heights of between 20 and 32 feet. The frangipani flowers are big and showy and give off a soft and sweet fragrance. They come in many different colors, but tend to be white and yellow in the middle. The touch-me-not is a flower known scientifically as Mimosa pudica. In Malaysia, it is called "semalu." It is also referred to as the "sensitive plant." When the leaves are touched, they start to fold together and hang down, hence the nickname. This sub-shrub, with a prickly texture, is a short-lived evergreen that produces fluffy pink flowers shaped like balls. Due to its thorns, the touch-me-not is considered bothersome in Malaysia. The bird of paradise, which is also known as Strelitizia rubinae, is very common in Malaysia. It is also referred to as "crane flower." The name of the flower comes from the actual species of vibrantly-colored birds. The bird of paradise is an evergreen perennial that can grow to be about 5 feet tall. The plant produces bright blue and orange colors, and has stiff, long stems. The leaves have leathery textures, and are about 6 inches wide and 8 inches tall. The actual plant is shaped similar to a bird, another factor in its name.